It was great to take advantage of the Steamboat Mountain during the week ended Feb. 2. As someone that lives in Virginia, the mountain and area are a delight. 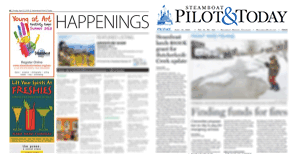 Further, I found the Steamboat Pilot and Today paper a good way to observe the local news and issues. So, it was interesting and almost humorous to see the letter to the editor from Ken Collins under the date of Jan. 26. With no pretense of any reasonable objectivity, he launched into the election of 2016 that he suggests started the undermining of democracy that President Trump continues to this day. Among the outrageous points made was that Donald Trump is chummy with the North Korea dictator but never mentioned the complete pause in the inflammatory rhetoric of North Korea about the destruction that they could inflict. Also, not mentioned was that the open testing, at least, of missiles with the capability to hit the western U.S. had stopped. Further there was omission that this outrageous North Korea behavior was something the previous administration was incapable of addressing or unwilling to do. He also delves into the destructive problems associated with the government shutdown before and pretending that the shutdown’s effects are all one sided. Never in that diatribe is it noted that the Democratic Party leaders, who could have provided what is in effect a pittance for a wall and compromise to reopen the government, have in the past openly made strong statements about the absolute requirement for a wall. But the best is saved for last as it suggests President Trump is doing nothing more than the bidding of Vladimir Putin by suggesting the former is little more than a puppet of the latter. Either forgotten or intentionally not mentioned was that President Trump has chastised Germany for buying Russian gas. Nothing is more critical to the very fragile Russian economy that its ability to sell that natural resource. And neither was it noted how President Trump approved weapons for the Ukraine, which was a poke in Mr. Putin’s eye and something the previous administration refused to do. And the U.S. movements in Syria were strongly opposed by the Russians. In short, the letter seems to be little more than that of a Democrat Party hack parading as a concerned citizen.